Just dropping you a line to say thank you for everything last week. We really couldn't have imagined just how much progress we could make in the one week of lessons we had. Your philosophy, patience and friendly approach instilled levels of confidence in us way beyond our expectation. As a result, on the last day we went up to the top and came down without any problems - Laura was a little anxious during the runs but still made it, the girls were fabulous! We'll be back next year for more lessons and skiing as we've truly got the bug. In the meantime, enjoy your tennis and time back in the states. confidently afterwards. I should have had a lesson years ago! Thanks again and I'll maybe see you in Flaine next year. 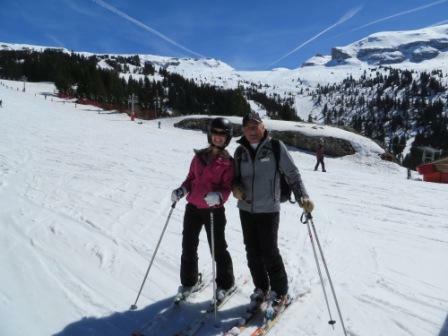 I have been meaning to email you and thank you for your patience during our week of lessons in Flaine early February. I feel my confidence has improved and we are even thinking of going skiing again next year. You never know we might go back to Flaine ! Andy was very pleased with your help and felt confident to go off on his own. Before we started, he was very worried about being in pain from experience of skiing last year but he felt no pain using your technique and he looks more stylish too! It would be great to see you again sometime. I just wanted to thank you for your expert tuition during my short break in Flaine. In the short time of just 3 lessons you managed to take me from a nervous skier with little confidence to a confident skier who can now enjoy the experience. 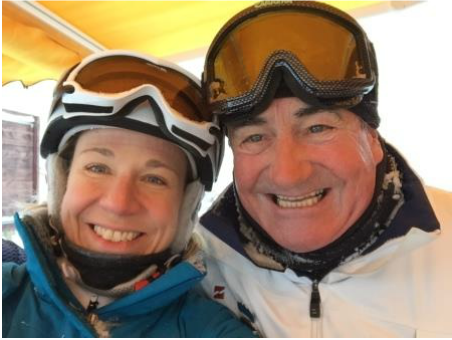 Your many years of experience meant that you were immediately able to see what changes I needed to make in my skiing technique to make it work- and soon my skiing became effortless and enjoyable. You also understood my anxieties and your gentle psychological coaching was just what I needed. Now, I am not just a skier- I am a poser and a dancer!!! I can't thank you enough. I wish you well for the rest of the season, and hope to see you again next year! Just a little line or two to say thank you very much for your patience and guidance in my skiing lessons last week. My only regret was not to have had them earlier in the week before I became a little apprehensive over the skiing conditions. Looking at the info and webcams now, we know the snow has arrived with more runs and lifts opening every day. Richard too really enjoyed his lessons. You instil so much confidence - he understands what he is doing much more than he used to. He is already looking forward to skiing in New Zealand. We are wondering whether to come out again at Easter but are not sure as yet. Hope you have a fabulous season in Flaine and a great 2016. 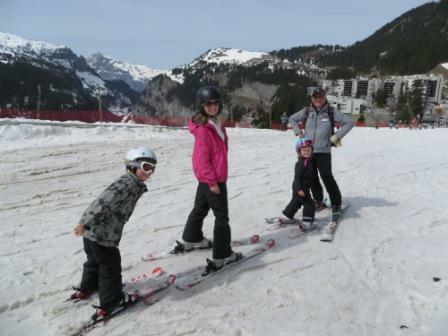 We just wanted to say a huge thanks for the fantastic tuition again this year in Flaine - we were all very pleased with our progress as in previous years. 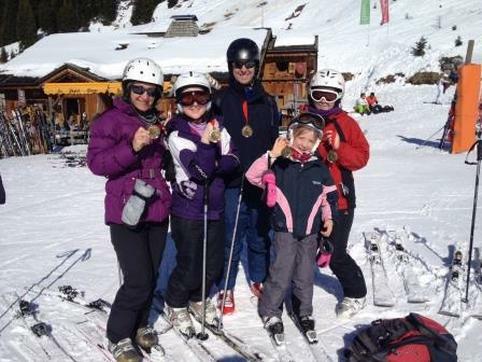 Attached is a very well-taken picture of the Smith Family Shadowing and Formation Ski Team (although not in action!). Thanks again and we hope to see you again next year. Please let us know when booking is open for the next season. Just wanted to say that we had a great week with Lynne. He makes such a difference to our ski trip. The weather was a bit difficult with about a metre of snow falling and visibility not the best. The snow however was lovely. The last day Ben, Claire and I did a last run down Mephisto and it was an unforgettable experience. It was like skiing on fluffy down pillows, so forgiving that one floated at every turn without any effort at all. I have always thought Lynne's inspiring blurb in his seasonal letter was all a myth as find skiing constantly slightly terrifying but clearly something has at last got through to my feet. Mind you Lynne did make us practice through the soft stuff quite a lot on Meleze (visibility being bad we lingered there) so perhaps a bit of his magic has got through to us. I won't mention the beastly run we did earlier in driving wind with completely steamed up goggles when I freaked out and couldn't ski at all - he was very kind and patient as ever. Plus AJ made great advances this year given that he is not a natural and was totally delighted with himself! We were too. I just wanted to drop you a note regarding the ski lessons you gave to my three children last week, the three of them have come on leaps and bounds since taking your lessons, I can’t believe the confidence you have installed within them which now enables them to ski all over the Grand Massif with Mum and Dad, even down the red runs with total control. We will be returning next year and I will be contacting you again to organise lessons for the beginning of the holiday, my wife even wants to join in the lessons since witnessing the kids progression. Have a good season and thanks for all your support. her mornings with you during our first week. Happy new-year and see you on the piste. I won the third place on giant ski slalom on ski-board in 2014. Hi Lynne, Hope you are well. We made it home ok, have done a lot of washing (well Amanda has), caught up with our family and friends and have downloaded our photos - a couple of which are below + attached. We all miss the snow and are unanimous in the review that last week was one of our best holidays ever, we all had a great time. A big part of that was you and your help in getting us mobile and up-skilled so we could enjoy the snow even more. A dream of mine was to have the whole family having fun in the mountains and to ski some runs together. I just wanted to say thank you because with your assistance that dream became a reality and I’m sure the start of something we will all enjoy for years to come. With the variance in age of our group from Molly who is just 4 to me 41, Amanda’s previous poor lesson experience and the fact it was the kids first time in the snow – good instruction this trip was a critical element. With your very measured and logical approach and very affable demeanour that worked at all levels - we all feel we flourished and grew as skiers immeasurably. 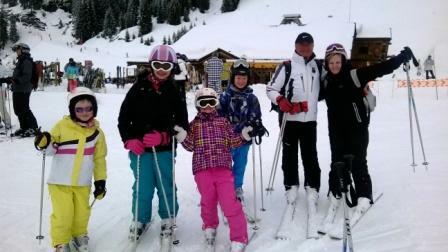 As a result we had a great time and are now really looking forward to our next skiing holiday as a family. Again, sincerely, thank you. We will let you know when we are back in Flaine, in the meantime have a great summer and feel free to copy and paste if you wish to add to your testimonials! which cuts out the middle man for next year, I'd be really keen to know. We really hope to see you sometime in the future. All the very best. Hope this email finds you well. Just wanted to say a huge thank you for your tuition (February 10th onwards). I was really able to put into practise your wise words and actually enjoy skiing (for a change!). 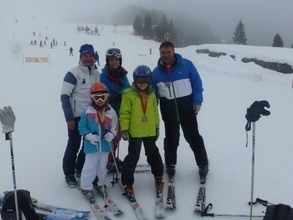 It was a enormous relief to overcome the fears I had over the years and to be able to ski with the rest of the family has made a big improvement to our whole holiday experience. I know Andrew is thrilled with the extra tuition he received from you on how to improve his technique, as well as knowing that I am finally enjoying the holiday too! I can't wait to be back on the slopes!! Will be sure to catch up with you if we visit Flaine again, in the meantime, take care. Just wanted to say a massive thanks for the enjoyable lessons last week, I'd forgotten that learning could be so much fun! Anyway back to slaving away under the horses again until we can revisit Flaine. I hope you have a great season on the slopes. 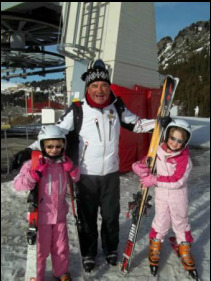 Just wanted to say thanks so much for Charlotte and Sophie's ski lessons last week - you transformed their view of skiing from something uncomfortable and scary that must be endured to something that they love and can be proud of. The smiles on the attached photo says it all. We hope to be back next year - but in the meantime thanks again and hope you continue to enjoy your time on the slopes and the surf!